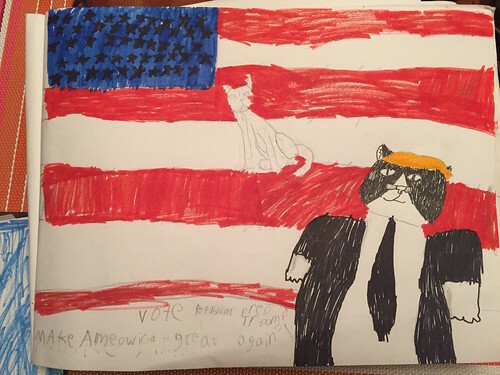 "Five cats are running for president of our house. 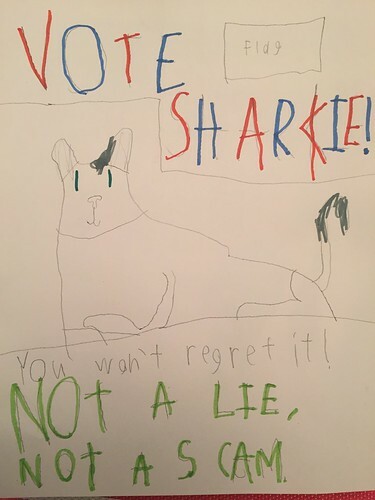 Draw campaign posters for them." This pretty much captures how Ruby would govern. I wish I could take credit for this idea, but Jack came up with it. He and Quinn made some campaign commercials as well. Those poor cats. What super posters, I love each one! When are the boys going to start their ad agency? I support this plan of yours. It's a wonderful assignment, but even better is the glee with which your kids completed it--these posters are BRILLIANT! The dog probably has the size, but the guinea pigs have the numbers.